A decade ago on Sept. 27, Chinese astronaut Zhai Zhigang took the nation's first steps in space, making China the third country in the world to hold the technology for extravehicular activities. 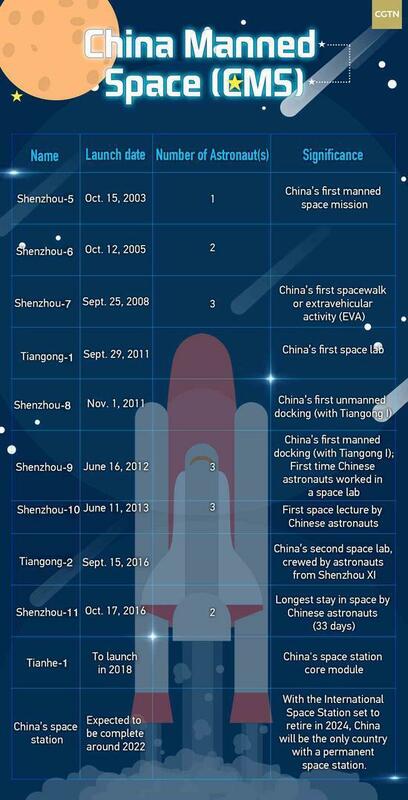 Zhai's historic step was a milestone in China's big picture of a manned space mission, and throughout the 15 years of development, there have been many other notable moments worth remembering. China sent its first man into space on Oct. 15, 2003, aboard the spaceship Shenzhou-5, becoming the third country after the former Soviet Union and the US to manage a manned space mission. Yang Liwei was chosen from 1,500 pilots and undertook the task of orbiting the Earth 14 times, traveling about 500,000 kilometers. He landed safely on the grasslands of China's Inner Mongolia Autonomous Region the next morning on Oct. 16. China's third manned spacecraft lifted off from the Jiuquan Satellite Launch Center in northwest China on Sept. 25, 2008. Aboard the vessel were three astronauts, Zhai Zhigang, the mission commander, Liu Boming and Jing Haipeng. Their mission included conducting an extravehicular activity as part of the second phase of China's manned space program. Zhai's spacewalk lasted for about 20 minutes, during which his colleague Liu provided help and Jing monitored the overall situation. Shenzhou-7 was in space for three days and returned at 17:37 BJT on Sept. 28, landing in Inner Mongolia Autonomous Region. The 8.5-tonne Tiangong-1, with a length of 10.4 meters and maximum diameter of 3.35 meters, providing a room of 15 cubic meters for three astronauts to live and work in, was launched from the Jiuquan Satellite Launch Center on Sept. 29, 2011. The main task of the Tiangong-1 was to test the technologies researched at the time, dock with a spacecraft, and accumulate experience for developing a space station. After being in service for four and a half years – two and a half years longer than its designed life, the space lab reentered the Earth's atmosphere, where it mostly burned up, on April 2, 2018. In June 2012, Shenzhou-9 spacecraft was thrust into space to dock with the orbiting Tiangong-1. This was China's first manned rendezvous and docking mission. Two docking tests, one automated and one manual were accomplished between Shenzhou-9 and Tiangong-1. It was also the first time for Chinese astronauts – Jing Haipeng as mission commander, crew mate Liu Wang and China's first woman astronaut Liu Yang – to board Tiangong-1. The mission meant China was fully capable of transporting humans and cargo to an orbiter in space, which is essential for building a space station. On March 31, 2018 the core module of China's space station was unveiled at Tianjin Aerospace Town in north China. Named Tianhe-1, the main control cabin of China's space station holds habitable living quarters and working space for a crew of three astronauts. According to the Astronaut Center of China, after the Shenzhou-11 mission, China's manned space engineering entered a space-station era. In early March this year, China Aerospace Science and Technology Corporation (CASC) said the Tianhe-1 module would be launched in 2018, followed by a series of launches for other components of the space station, including two space labs, which will dock with the core module while in space, in the next four years or so. The most interesting part of space exploration may be the personal friendships the international astronauts have developed while in space. In 2016, Jing Haipeng enjoyed a cake from the European Space Agency at a birthday dinner party in space. French astronaut Thomas Pesquet also had a taste of Chinese food in the International Space Station shortly after. Starting from scratch, China's manned space program is now witnessing a rapid growth of international cooperation. In the future, China will continue to be open to cooperation, explore space and utilize space technologies for the benefit of people of all countries.